At The Paddington Dental Surgery we aim to provide all of our guests with a pain-free dental experience. We want you to have a comfortable and pleasant appointment, so we’ve developed unique services to ensure that you leave with a positive feeling whenever you visit. Imagine actually liking going to the dentist? Well, we feel our attention to patient comfort enables us to provide a first-class service, dramatically reducing the anxiety that many people feel when visiting the dentist’s office. Warm Towels – Who doesn’t love a warm towel or a soft blanket and pillow? Our patients get the first-class treatment, making them feel comfortable and relaxed. A Gentle Touch – All of our dental professionals are trained to pay close attention to patient comfort and minimise any potential for pain of any kind. 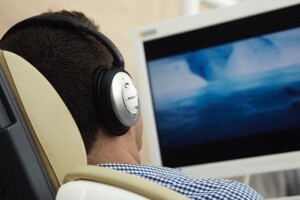 Entertainment – We can help set you at ease by offering Bose® noise cancelling headphones and your favourite movie or music while we transform your smile. Sedation Dentistry -We are very happy to offer ‘Happy’ gas, oral sedation, sleep dentistry, and other methods in order to help you stay calm and comfortable. Drill-Free Dentistry – We offer advanced dental techniques, including powerful yet gentle air abrasion to remove bacteria and micro-invasive infiltration technology to arrest decay progression. Through these techniques, we’re able to set the standard in state-of-the-art decay removal – often without the need for a dental drill and tooth numbing. Laser Dentistry – We often utilise lasers in place of invasive dental tools, particularly for periodontal (gum care) treatments. Laser dentistry is virtually painless. Comfortable Numbing – Oraqix® needle-free tooth numbing. The Wand computer-controlled anaesthetic delivery system (offering painless digital numbing) and the DentalVibe® (making it so that you feel vibrations instead of a needle) are all comfortable numbing options here at our practice. We offer our patients the highest quality dental care while addressing concerns over pain, fear and anxiety associated with standard syringe injections. Our Naturopath – Patients with a fear of dentistry can benefit through the use of the homeopathic, botanical and nutritional medicine that our in-house naturopath can provide. For more information on pain-free dentistry or if you’d like to schedule a consultation, please contact us today.